Ah emotions, they are a funny thing. Sometimes you shouldn’t show them to appear stronger and other times they are the one thing in the driver’s seat steering you straight ahead, separating your head from your heart. At the end of the day emotions, specifically crying, is a universal way for you to ooze out what you are feeling. Some people are lucky and can almost word vomit, or should I say emotion vomit, while others like myself bottle everything up until the bottle is at its fizzing limit and the poor plastic top pops off causing everything that has been built up to explode out. I like to call these emotional breakdowns. Being that I’m like this it is a rarity that I cry at a show. Music has been and will always be a major part of my life. I am a music/entertainment journalist. We live and breathe the newest artist that is about to break out, where the biggest tour will be played and who was the highlight of that artist showcase. All of these things mixed together typically make for a non-overly emotional night at a show, especially when I’ve been to three in one week. However, that all changed recently. Niall Horan is the culprit and I know what you may be thinking: “Really? Niall?” or “She was clearly just exhausted from being at three shows that week.” You’re all wrong. The tears were real and as hard as I tried to choke them back the perfect droplets started dripping down my highlighted face when he sang “Fools Gold”. You read that right. A One Direction Song. You see, I’m in what I like call a transition period in my life. I’m officially in my mid 20s and to be honest nothing seems scarier. 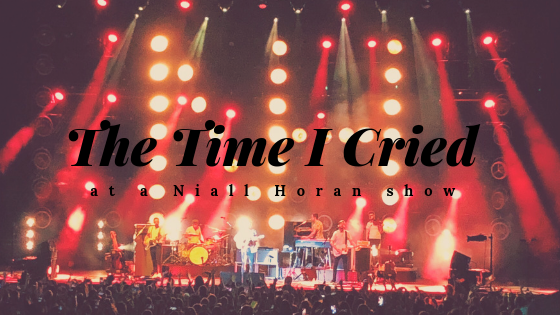 So there I was, 25-year-old me feeling some kind of way when good ole Niall Horan was strumming away on his acoustic guitar singing none other than One Direction but you know what? I didn’t care! The girls next to me had to have been 8 when 1D exploded onto the scene and the friends I were with couldn’t figure out how they didn’t know the words being beautifully sung out of the Irishman’s mouth. All of the memories I have had over the last eight years came flooding back into my brain. Some of the best times were at 1D shows. I was a freshman in college when those (at the time) five Brits stole my heart and turned me and my friends into obsessive boy band fans. There was no shame in my game and will continue to be none. I met my best friend bonding over those boys and without her in my life I would be an even worse hot mess. As the song began to end and the final chords were played I began to wipe the tears away from my face, take a deep breath and reflect. Not only was I cherishing that moment but I had realized how many times I had taken for granted being at an amazing show. I texted my friend group that had been brought together by those boys and expressed how much I missed them before I put my phone away for the rest of the concert. I didn’t want to remember this show through my cell phone screen. I wanted real mental pictures, real organic memories.